I was thinking of how I wanted to decorate these sweet little things this year, when it hit me to make them into luchadores. 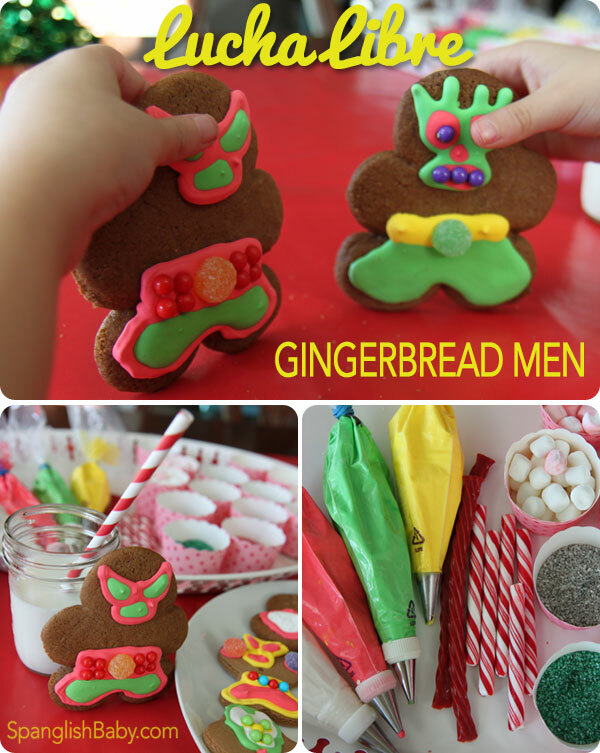 My bicultural train of thought went something like this: gingerbread = marranitos = panadería = Mexico = lucha libre. Of course, who doesn’t love lucha libre?! I’m a HUGE fan of the masked Mexican wrestlers, especially those vintage folk heroes like Mil Máscaras, Blue Demon and El Santo. I like classic lucha and kitschy lucha, and the idea of two identities and two sides to everyone. And I knew my daughter would just love them, because she could, in her words, “Fight them!” Yeah, too much My Little Pony Equestria Girls for her. Disclaimer here: I am no cookie artist, so that means anyone can make these. I’m not even that good at baking cookies. As a mom, you work at the things you want to be great or just good at. And you’re okay with being mediocre or even bad at some things. I’m okay with being an okay cookie-maker. I make up for it by being an absolute pro at cookie-eating. This holiday season, I did use a little help in the kitchen from my old friend Betty. Yup, I bought a box of gingerbread cookie mix (take your pick, from Betty Crocker to King Arthur to Williams Sonoma mixes) and called it a day. We’re in the thick of the holidays, I’ve got a fussy, teething one-year-old who wakes up at all hours of the night, blah, blah. Best decision ever, and they turned out pretty delish. Still, there are plenty of great gingerbread cookie recipes online, and this soft gingerbread cookie recipe by Inspired by Familia looks yummylicious. If you’re new to decorating with royal icing, it’s awesome (until your hand starts cramping and you have to clean up!). It’s the type that hardens after you decorate, so it’s perfect for using on plain cookies like gingerbread or sugar cookies. One of my favorite cookie decorating blogs is Sweetopia. Who knew cookies could look sooooo pretty? I especially love her 10 tips on how to decorate cookies with royal icing. In the past, I’ve actually followed her tips closely and come out with Pinterest-worthy cookies. Below is her recipe for royal icing. For ideas on how to decorate the luchador masks, go to Flickr or Google and just search for lucha libre mask and you’ll get an array of photos showing various masks and designs. Pick a few and practice freehanding the design on wax or parchment paper before actually piping onto the cookie. My luchadores didn’t turn out perfect looking, but in our house, they were just the thing we needed to give our holidays a bit of Mexican flavor. Here are the two recipes you need to follow. Have fun! **Add one teaspoon of clear vanilla to this recipe if using a meringue powder with no vanilla flavor. **You will also need several decorating piping bags and tips, available online or in most craft stores. You can also add candy or sprinkles to your gingerbread. -Cream softened butter and add brown sugar, and beat until fluffy. -Add the flour, baking soda, cinnamon, ginger, clover and salt. -Refrigerate the dough for an hour. 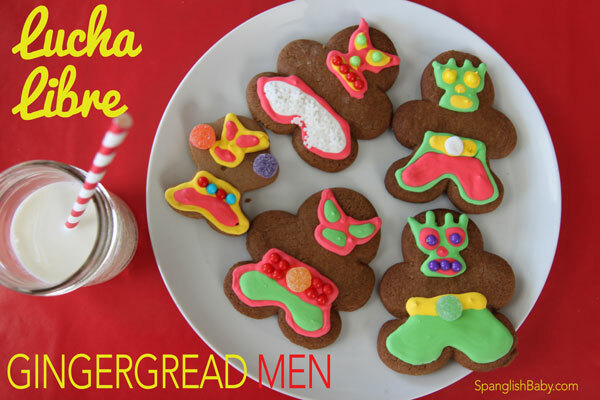 Roll it out on a floured surface, and cut out into gingerbread men using a cookie cutter. Bake for 10 minutes, and then let cool before icing. -In mixer bowl, pour in the warm water and the meringue powder. Mix it with a whisk by hand for 30 seconds. Add the cream of tartar and mix for 30 seconds. Add the powdered sugar, and using the paddle attachment mix on the lowest speed for a full 10 minutes, until icing turns thick and creamy. -Cover the bowl with a dampened kitchen towel to prevent crusting and drying. -Now you can tint smaller batches of the icing with food coloring, or thin it by adding small amounts of warm water until you reach the desired consistency. I love these! You guys are so creative. We’ll have to try them. Thanks for sharing! This and reading Yuri Morales’ new book makes for a special “lucha libre” day! I’ve truly read several perfectly goods in this article. Seriously worth bookmarking intended for returning to. I personally amaze that the great deal endeavor you add to make this kind of great insightful web-site. SO colorful and so tempting, you have great blog and everything on the right side bar keeps you busy on the blog. keep it up! Productive strategies for X-Men Days Of Future Past (2014) download you can use starting off immediately. it looks yummy . Thanks for sharing! This recipe look so much delicious i will definitely try this at home today..
you have great blog and everything on the right side bar keeps you busy on the blog. keep it up! you have extraordinary blog and everything on the correct side bar keeps you occupied on the blog. keep it up! I’ve genuinely perused a few superbly merchandise in this article. Truly worth bookmarking proposed for coming back to. I for one flabbergast that the considerable arrangement try you add to influence this sort of incredible smart web-to webpage. I adore these! You folks are so innovative. We’ll need to attempt them. A debt of gratitude is in order for sharing! Got to appreciate the way you have set this up.